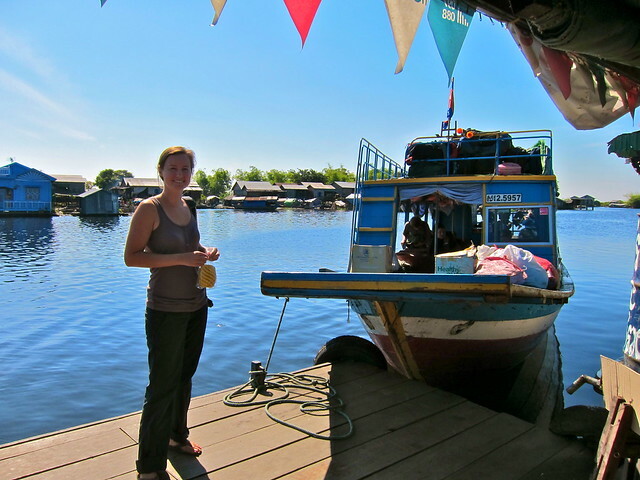 Floating – errr, pushing – our way down the Tonle Sap River – snackettes. From the village of Battambang, there are two ways to get to Siem Reap, our next destination in Cambodia: take a cheap 4-hour bus ride along paved highway or take an 8 hour trip on an uncomfortable boat that is infamous for breaking down, getting stuck on the bottom, being expensive, and frequently requiring a push from the [un]obliging customers. From the title of my post (and, seriously, if you know our personalities at all…), you’ll know that we happily opted for the latter! We pushed off from the docks at the Battambang pier on a rickety old ferry on an unexpectedly chilly morning and headed east down the Tonle Sap river toward Siem Reap. Alongside us, fishermen jostled for space in tiny wooden boats, pulling in lines, casting out nets, paddling to the next fishing hole. Lining the riverbanks were tiny wood shacks with corrugated metal roofs, many of them held up by pilings that now stood at disconcerting angles. Each shack had the obligatory adorable, half-naked 3 to 5 year old kid running out to wave and greet our passing ferry, as they must look forward to every day at this time. 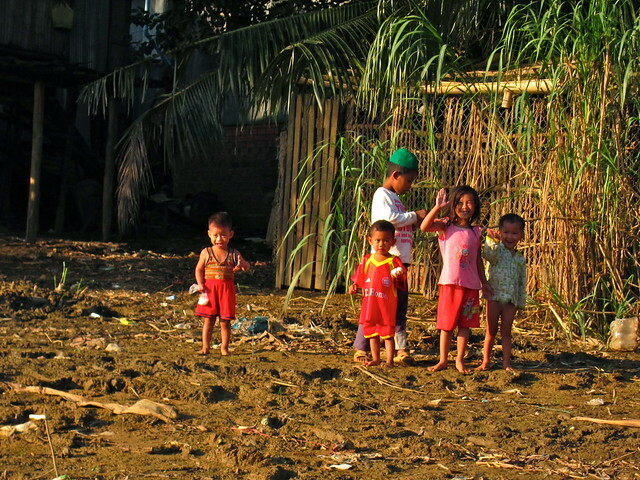 It was a window into everyday Cambodian life (a window right into their backyards, really). It was charming, beautiful, and also a stark reminder of how harsh everyday life is for most of these people. This river is their lifeblood, and yet you can’t help but notice the garbage that has piled up on its banks and the constant putrifying smell that is just a little too rotten and sewage-like. As much as my training as a microbiologist tells me that many of these people must not have access to clean drinking water, I want to believe that certainly in these modern times the villagers here have been educated on how to make their water safe to drink, or at least have alternatives to fresh drinking water other than this river. Then literally within seconds of this thought, I watched horrified as a boy of about 16 sitting on a fishing boat reached down to scoop a big white bowl into the river, and, as much as I wish it weren’t true, take a long drink. Here, I had been trying to shield the water droplets that sprayed off the surface of the water from even hitting my lips, and then to see something like that…. 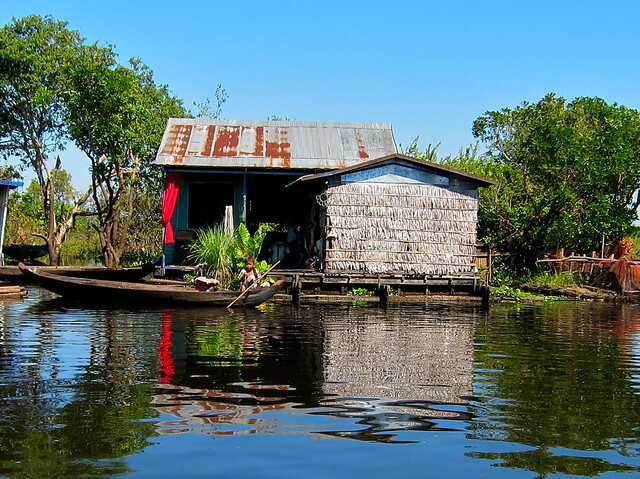 A few minutes later, the shacks and adorable shouting children began to thin out and we entered a beautiful floodplain surrounded by marshy trees and lilly pads. Once a year, a large portion of Cambodia floods for several months at a time (all of the houses here are built on tall stilts to account for this), and what we were essentially “boating” on was someone’s now-flooded backyard. This became more apparent as the trees began closing in more and more until we realized that we were, in fact, no longer on a river but were in a forest. A very flooded forest. At one point we began dragging vast pockets of roots and bushes, literally ripping them out of the soil, as the crew fought back the encroaching forest with their oars and pushing us along through the brush. Our boat began was bombarded on all sides from thick branches that slapped down the sides of the boat and caused us all to dive into the center of the boat for safety (I actually ended up getting smacked in the arm by one of the branches when I ducked a little too late, and it left a nasty little purple welt!). 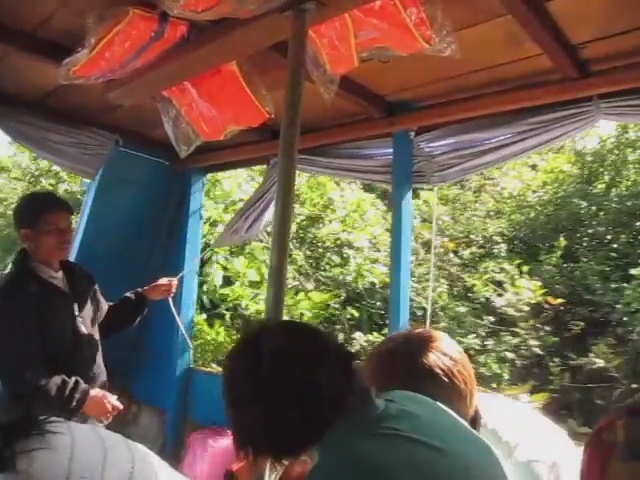 After we cleared the forest, we motored back into a true river again, where we came upon a series of villages. 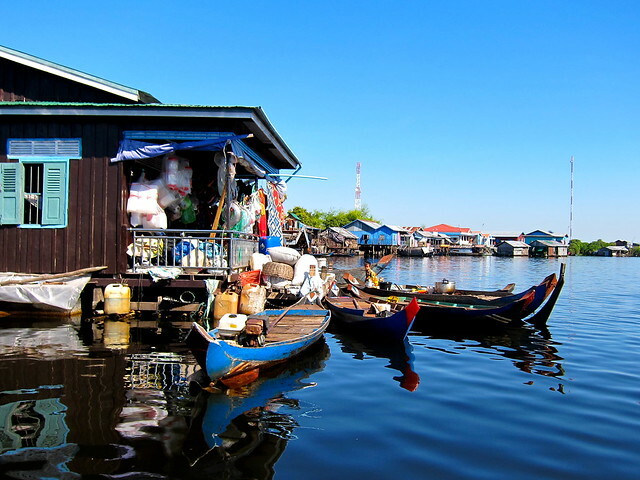 Unlike Battambang however, these villages were not set on the riverbanks; these were year-round floating villages! Every house, every storefront, restaurant, and pharmacy were on floating platforms that could only be accessed by canoeing from one building to the other. 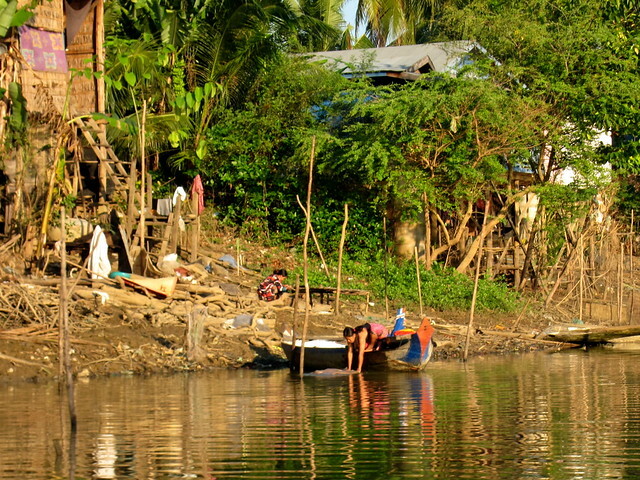 There was no other civilization for miles, so for each village that we came to our ferry stopped to drop off huge bags of rice, pallets of sodas, and bags of fruit to the villagers, who rowed their canoes out to meet our ferry. And once again, I was found myself wondering what on earth these people do for clean water (besides obtain it from the passing ferry), when suddenly we happened upon a large modern-looking building (floating, of course) – a USAID clean water-dispensing station! In a place that does not appear on any map, completely removed from the modern world except for a daily ferry that passes by its docks, someone had come across this place, seen what was clearly a huge need, and acted on it. So inspiring. 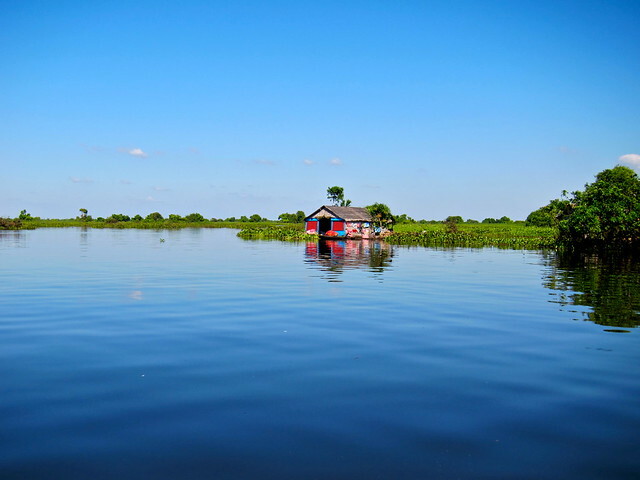 Eventually, we reached Tonle Sap lake and sped the rest of the way to the banks of Siem Reap. The boat did end up taking the prescribed 8 hours that our driver said it would take, and we did have to pull our way through some seriously thick (and painful!) 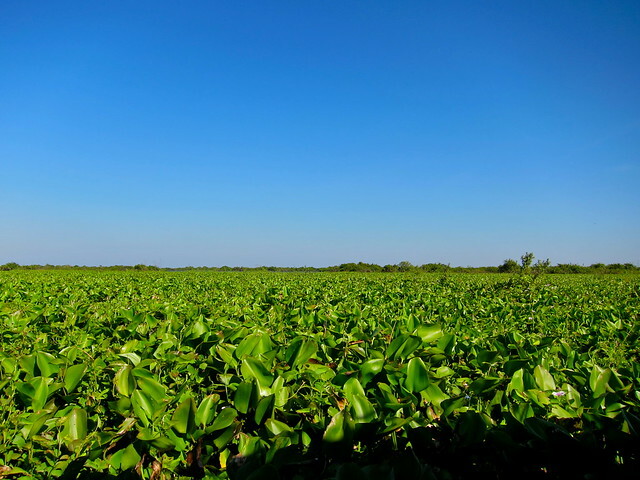 shrubbery, but in return we saw some beautiful, mesmerizing, and heartbreaking realities of everyday life along the Tonle Sap River. i couldn’t help but think of jamaican “no worries, mon.” when i read your favorite phrase. what a long way you have come , stephie. with every blog i am moved by your thoughtful, beautifully written memoirs. I love reading about your adventures. The way you both write is incredible, I feel as though I’m right next to you experiencing everything you are telling me about. You have been in Cambodia for a while now and I’m really starting to miss it. Steph, the part about everyone ducking towards the center of the boat for safety from the branches is hilarious and it totally cracks me up! I look forward to your next post!!!!! !